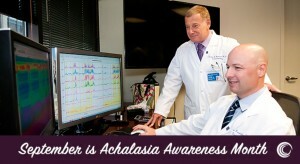 September is Achalasia Awareness Month! September is Achalasia Awareness Month, and the Digestive Health Foundation is committed to a brighter future for achalasia patients and their families. By funding critical research and education, DHF helps advance the work of Dr. John Pandolfino and his team of renowned medical researchers at Northwestern Medicine’s Digestive Health Center. These devoted doctors are making great strides in the treatment of achalasia, a serious and rapidly growing diagnosis where the muscles of the lower part of the esophagus fail to relax, thus preventing food or liquids from reaching the stomach. If you would like to support the DHF mission, which includes achalasia research and education, please make a gift here.